Chimborazo rises from Ecuador's altiplano. AAI Collection. 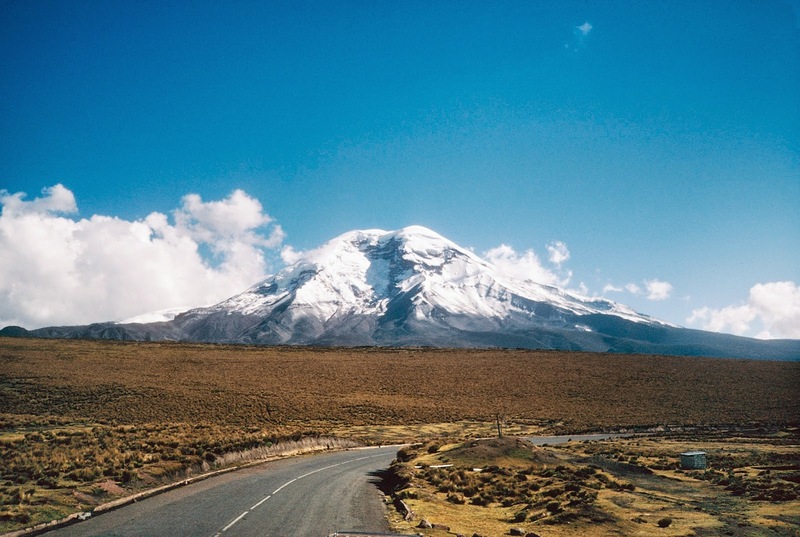 In recent years, climbs of Chimborazo have been more treacherous due to climate change, which has caused massive glacial melt resulting in extreme rock fall danger. However, a new route has been developed thanks to the guiding community in Ecuador, which avoids this threat. Almost everyone who has climbed Chimborazo has done so by one of four routes on the mountain's southeast side: The Whymper Route, the South Ridge, the Thielman Glacier direct, and the Thielman Glacier approach to the South Ridge route (the last two pioneered by AAI guides in the late 1970s). More recently and for a period of several years, those routes fell out of shape because of sequential seasons of low snow fall and warmer temperatures which combined to create rock fall issues. In that period AAI moved to the north face on another route that AAI guides established in 2007. However, since then an active volcano in Ecuador's eastern cordillera has been in an intermittent but fairly steady state of eruption for several years. 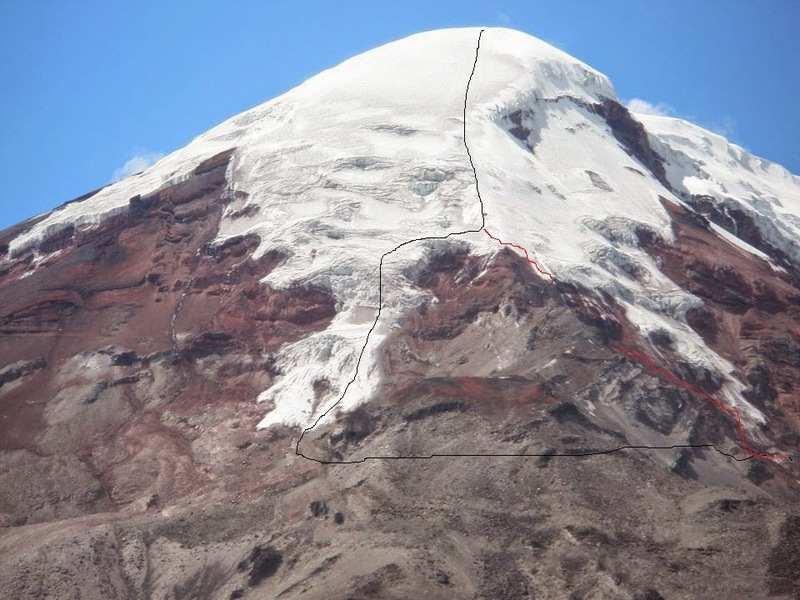 The ash that it has thrown into the atmosphere has been deposited in significant amounts on Chimborazo's north face, accelerating snow melt and making the route extremely icy. With belays required on a large percentage of its many pitches, the north face is not currently a practical option. Climate change has continued to result in melting ice and poor conditions on the normal route on the southeast side as well. In 2014, AAI guides took part in a successful expedition to find a new safe route to the summit. This new route, which we will return to in 2015, leaves from the Plaza Roja, near the Carrel Hut (currently closed for renovations) and climbs the Stübel Glacier. The Stübel Glacier route not only provides less risk but also more adventure, as climbers camp with the help of porters rather than use mountain refuges. Climbing Chimborazo requires at least seven days of acclimatization, which AAI achieves through strategic excursions and climbs of peaks like Cotopaxi and Cayembe, or for more advanced climebrs, Illiniza and Antisana. After completing this period of acclimatization, we spend a refreshing night in a hacienda in the 9000-foot (2750m) central valley. The next morning we drive up Chimborazo's flank to reach a small lodge at 13,200 feet (4023m). It sits in picturesquely on a grassy plain below Chimborazo and allows us to enjoy a good rest day and views of the altiplano surrounding Chimborazo and nearby Carihuarirazo (also known as Chimborazo's Wife). The high elevation keeps our ongoing acclimatization robust and is another perfect intermediate step up from the central valley as we prepare to move to the hut on Chimborazo. The next morning we make a short drive through grasslands to the south side of the mountain and then continue higher to the Plaza Roja (4,852m / 15,914 ft) located close to the Carrel Hut. From there, it takes us about two hours to walk to the Stübel Camp (5,050m / 16,564ft ) where we spend the afternoon preparing for the climb the next day. Climbers help carry equipment to camp, while porters carry the tents and water. Starting the climb at about midnight, we follow the Stübel glacier until it joins the Castle Saddle (5,500m / 18,044 ft). This new variant to the normal Castle Ridge route, free from rock fall, makes it a much safer line to the top. From the Stübel Camp it normally takes eight hours to get to the Whymper summit. By the time we reach the 18,500 foot level (5640 m), we will have surmounted most of the technical challenges on the mountain, and on the remainder of our route we will ascend compact and moderately angled snow. We reach Veintimilla summit at 20,500ft, where we could see Tungurahua (an active volcano often erupting). From the Veintimilla summit, we take our last short rest before traversing to the main (Whymper) summit. This final push takes 20-30 minutes, depending on the amount of recent snowfall. The summit crater area is a vast one that is normally covered in its entirety either in soft snow or nieve penitentes. The descent to the Stübel Camp takes three hours. After returning to the camp, we pack and descend to Plaza Roja, or we will stay another night if necessary. We'll head back to Quito, or if we have an extra day because good weather facilitates an ascent on the first of our two summit days, we will return to the central valley and then travel east, part way down one of the major routes to the Amazon Basin. We will stop in the mountain valley town of Baños where the lush vegetation is home to an unusually large variety of orchids, butterflies, and hummingbirds a dramatic contrast to the flora and fauna of the alpine zones where we've been travelling and climbing. Based in a comfortable hotel near waterfalls and natural hot baths, we'll enjoy swimming, relaxing, and exploring the Rio Pastazas Canyon that flows with some drama (waterfalls!) to the Amazon. A bicycle descent of part of the canyon is an option. On our final afternoon, we'll return to Quito and look forward to a final celebratory dinner and a chance to review the highlights of our diverse and exciting trip together. 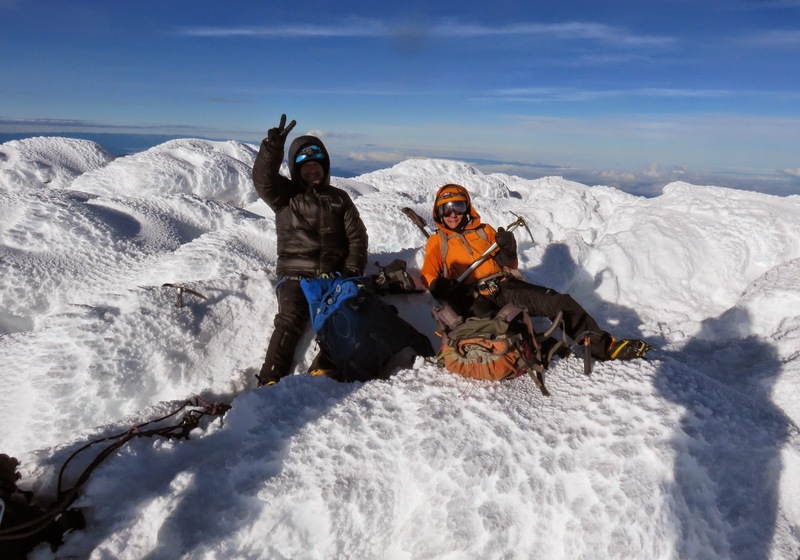 A group of AAI climbers in 2014 on the top of Chimborazo. Craig Hore. If you're interested in climbing Chimborazo via the new route, email info@alpineinstitute.com or call 360-671-1505.